On an excursion to Morocco, we spent 2 days in Fez and took a tour of the medina (the city center and market place). While there, we visited a textile shop, specializing in scarves, and traditional dress. We got to see one of the weavers in action, making a scarf and learn how the threads are made. We also got to pick a scarf of our choice and learn the proper way to tie and wear it. In this picture, I am wearing my scarf while the weaver sits at his loom in the background. 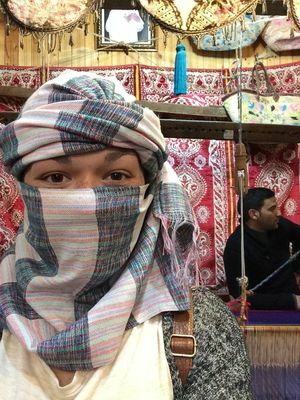 Marin, Mikenna, "When in Morocco, Dress as the Moroccans do" (2015). Study Abroad Photo Contest. 31.